Which are better: Montreal-style or New York-style bagels? There are well-documented inter-city rivalries all across the US, from the New York vs. Chicago pizza debate to the Seattle vs Portland soccer debate (wait. DON'T STOP READING! SOCCER IS HERE TO STAY! ), but rarely do food rivalries go international like the Montreal vs. New York-style bagel conflict, which has been raging between the two metropolises since bagels were popularized by Eastern European immigrants in the early 20th century. So, in the interest of putting this whole issue to rest, we decided to evaluate New York and Montreal bagels on a variety of factors that we look for in the perfect bagel. Let's see who puts their dough where their mouth is. New York: Huge and almost uniformly round, like a hockey puck for people who like playing sports with food. The New York-style bagel has more girth and a smaller central hole, meaning that there is more overall surface area on the bagel for whatever your schmear-of-choice is. Montreal: Montreal bagels, on the whole, are slightly smaller than their American brethren, and thinner where the New York bagels are fat (kinda like the difference between Canadian and American people), with a larger hole that makes the bagel almost half negative space. In the bagel world, accoutrements are king -- and there's just more room for them on a New York-style. New York: The classic New York-style is chewy and a bit on the fluffy side, due to it being boiled first and then baked in a traditional oven. Montreal: The process for making a Montreal-style bagel is a bit different from the one Americans are used to -- it's boiled in a sugary honey water before being crisped up in a wood-fired oven, giving it a distinct char and an almost caramelized crunch that encapsulates a dense, doughy interior. There's something to be said for that rich crunchiness that yields to a dense interior. The Montreal bagel has much more breathtaking topography where the New York bagel has a pretty uniform consistency throughout. New York: Salt and malt, those most timeless of partners, come together in rare form for the New York bagel. It's a simple marriage, but one that's worked out well for both sides. Some claim that the water quality/composition of NY also gives these bagels a slight advantage, as the stuff they're bathed in has low concentrations of calcium carbonate and magnesium, making the bagel puffier and more aerated. Montreal: Our neighbors to the North have a few slight differences in their bagel recipe, including the addition of honey in the water and the dough, as well as a more generous helping of eggs. There's a lack of salt as well, but the natural proteins and sodium from the eggs more than make up for that. New York might have better water, but the formula for a good Montreal bagel's got it beat with the addition of sweetness, which will definitely be concerned with me. New York: In any bagel shop in New York, you'll find a veritable pantheon of bagel types; pumpernickel, raisin, garlic, onion, salt, bacon, everything, sesame, poppy, and everything else under the sun. 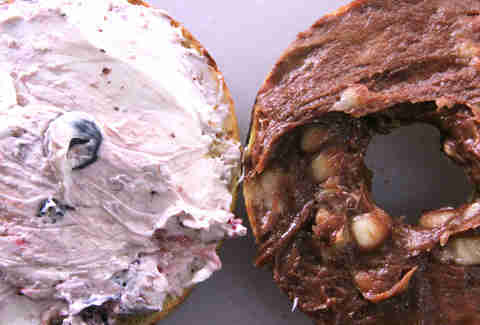 The diversity of New York bagels makes them stronger, much like Captain Planet. 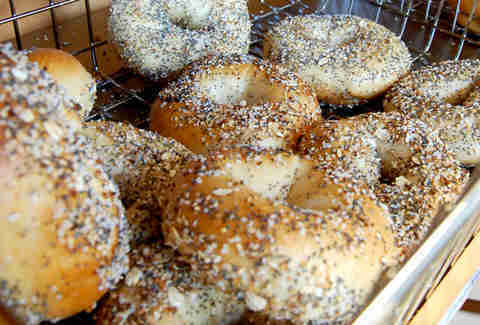 Montreal: In Montreal, however, the decision of what type of bagel to get is usually much simpler. 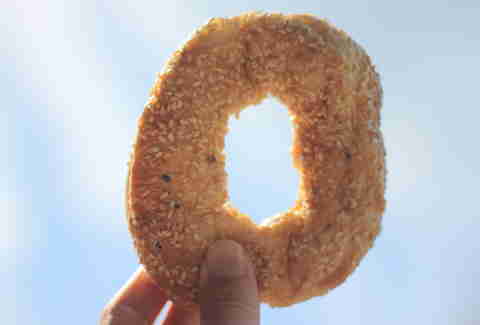 Purists stand by the idea that the only true Montreal bagel can be topped with either sesame or poppy seeds ("black seed" or "white seed", in their lingo). 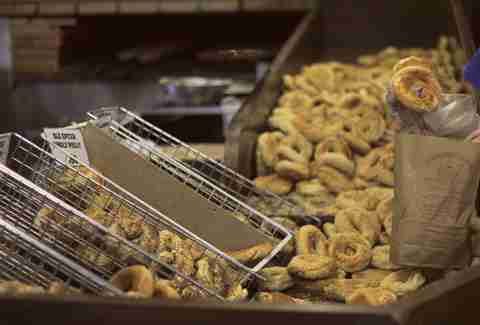 Having a huge array of flavors is a boon to any bagelry, since it allows everyone to find something that'll make them happy. New York: Plush, inviting, rich, and savory, the NY bagel's flavor profile has a simple honesty that will make you love it all the more. It tastes like whatever you want it to be -- and the dizzying array of schmears you can put on it make it even better. Plus, toasting is a huge element of the taste of a New York bagel, and most institutions will give you the option to get your bagel charred and steaming. The perfect breakfast vehicle. Montreal: Subtly sweet but solidly bready, the Montreal bagel tastes like a slightly more sugary Italian loaf that's been condensed into a ring shape. 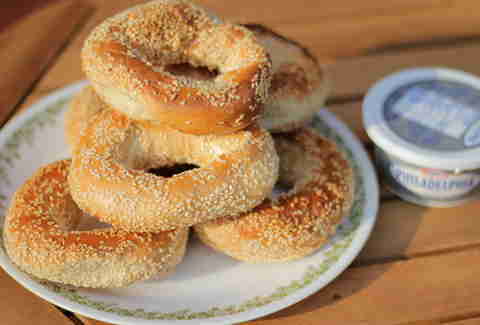 Most purist bagelries in Quebec won't give you the option to toast your bagel, however, owing to the belief that the bagel's flavor speaks for itself and needs no modification. In the end, nothing beats the versatility of a New York bagel. It's malleable, it's adaptable to a variety of palates, and the savoriness adds an extra kick of flavor that just isn't present in the Montreal-style's unsalted recipe. The world champion bagel -- New York In this great debate, we can only look at the qualities we each search for in a great bagel in order to determine who takes the crown -- and, in this case, the New York bagel reigns supreme. The Montreal bagel has a storied history and put up a great fight with its unique mix of sweet and dense, but when it comes down to it, a bagel is a vessel. It is your vessel, for whatever customizations you want to add to it. 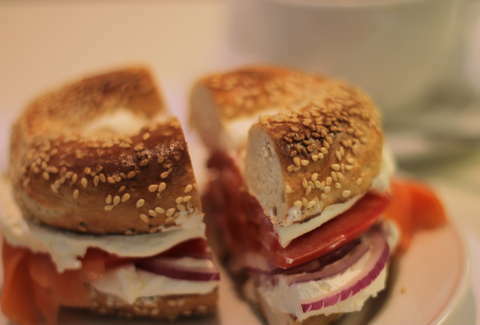 The New York bagel is all about you, and that is its greatest strength. It just wants to make you happy, and that's what it does. Also, it's much better than a breakfast taco. Adam Lapetina is a food/drink staff writer at Thrillist, and a noted anti-scooping activist. Follow him to everything bagels with jalapeño cream cheese at @adamlapetina.